This Black and Gold Lace Maxi Dress with Tulle Detail is absolutely stunning! This maxi features an elegant Black color, lace detailing and a tulle detailed skirt. Feel like a princess wherever you go in this maxi dress! I was very excited to get this dress and it is beautiful! I was a little nervous because the style isn't one I typically care for on my body, but I was in love with the dress. 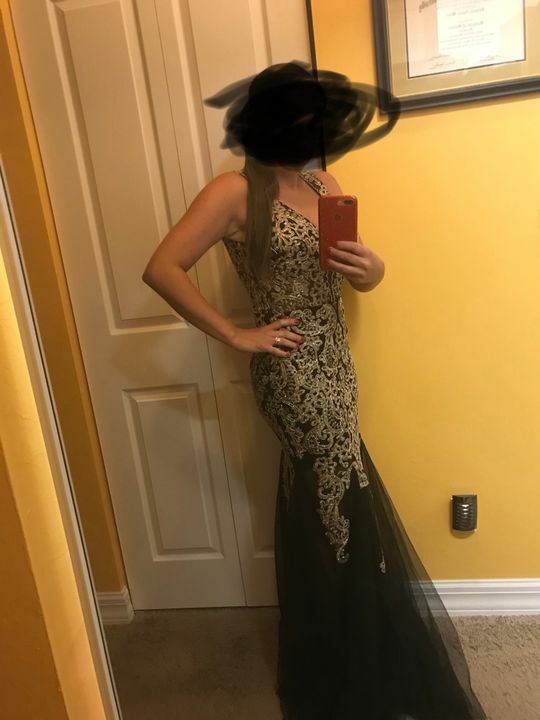 It looked great on and I got so many compliments wearing it to my boyfriend's formal event for the military. I love this dress. I am so picky with dresses, I am also short so long dresses never look good on me. This dress fits PERFECTLY. I loved it. And Saved by the dress was so helpful with my return. Love it. The dress came in just a few days after purchasing. Which is good. There wasn't a long wait. It was really pretty and well made. I will have to get it taken up a bit because it was long but I am only 4"11 so I figured I would have to get that done to it for it to fit me perfectly. Everything about the product is good except I really didn't like the packaging. It was wrapped up inside of a plastic baggie... I was expecting to order a dress and it come in a box but I have never ordered a dress before so I don't know how that is supposed to be done. But overall I like the dress and I can't wait to wear it on my sister's wedding night!